This luxury 800 fill power, white goose down comforter is very soft as it is crafted with 700 thread count, 100% cotton sateen face. The baffle box design keeps the fill evenly distributed and ensures better soft and comfortable sleep. 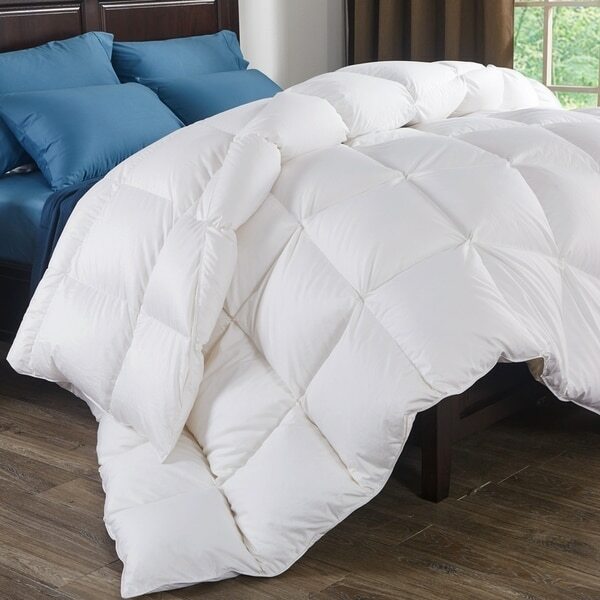 Filled with 93% white goose down and 7% white goose feather for cozy warmth and softness. Comforter is made from 700 Thread Count 100% Cotton Sateen face. Filled with 30 ounces of 93% White Goose Down and 7% White Goose Feather. Machine wash. Made in China. Dimensions 88.0 In. X 68.0 In. X 5.0 In. It isn’t nearly as full as photo describes, I have to say I am disappointed and past the return stage. The photo makes it looks super full and comfy very flat and thin.